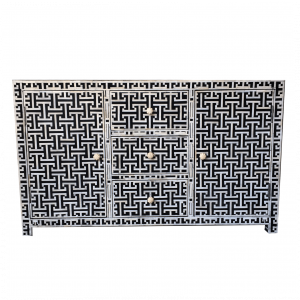 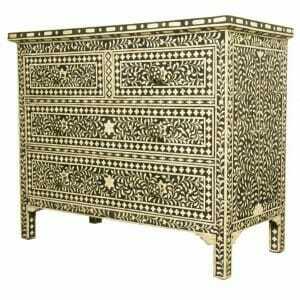 A stunning symphony in subtle patterning this Indian chest of drawers shows off the fine skills of hand carving and artisan craftsmanship. 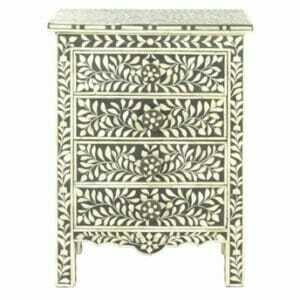 The light grey of the bone inlay dresser gives lift and dimension to the detailing, which stands out while retaining its softness, making the inlay dresser an artfully understated feature piece. 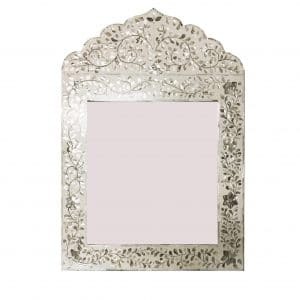 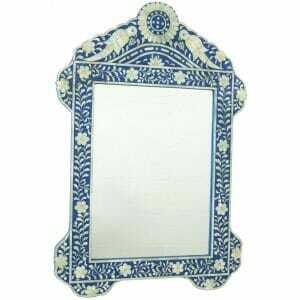 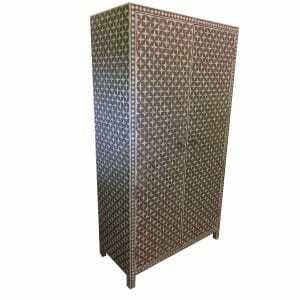 Perfect for most colour schemes and able to change its position and purpose to move with your evolving lifestyle. 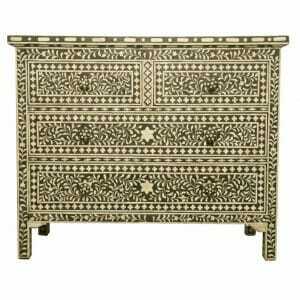 In Udaipur, known as the craft capital of India, pieces like this oriental dresser are conceived and created by the traditionally trained artists and fine furniture makers, who were commissioned by Royalty to fill the many palaces of the land of Kings, Rajasthan. 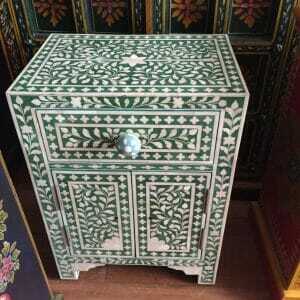 Our makers still take commissions from Royalty and we are proud to display their work here, for your delight. 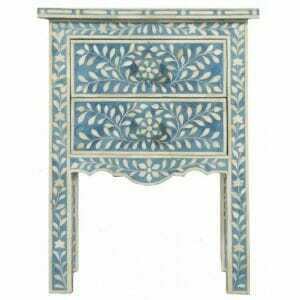 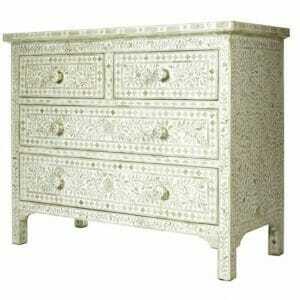 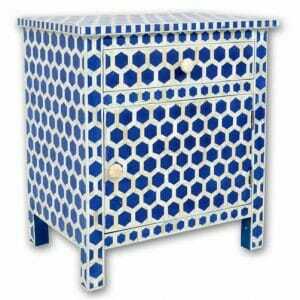 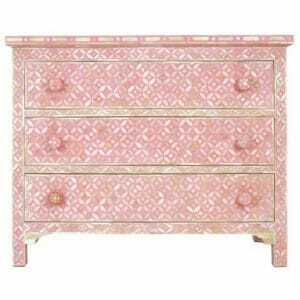 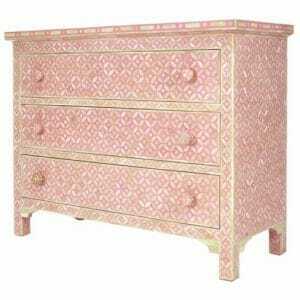 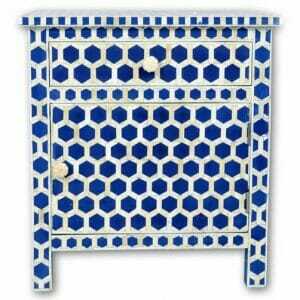 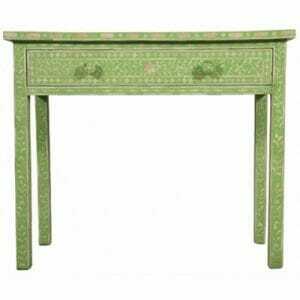 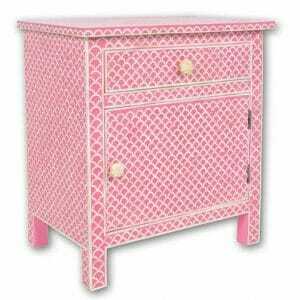 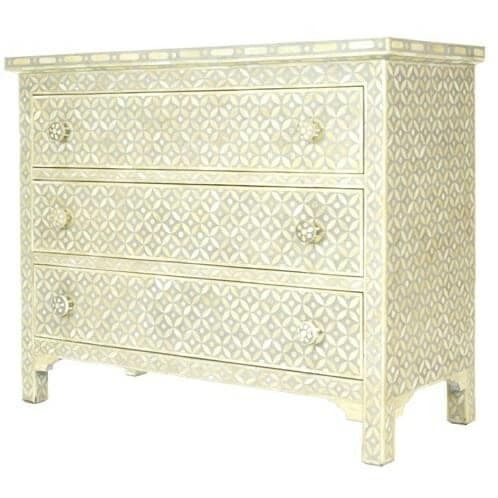 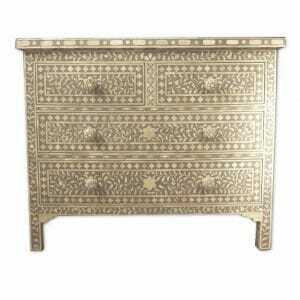 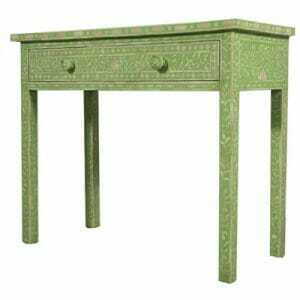 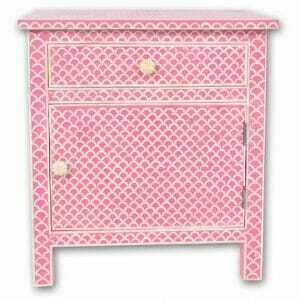 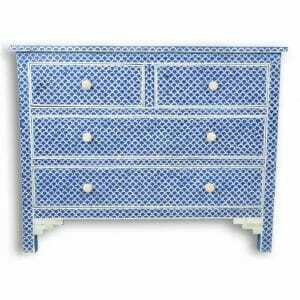 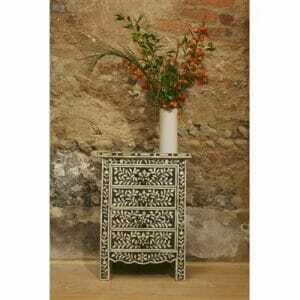 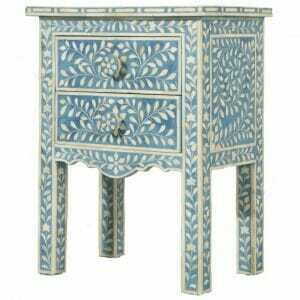 The bone inlay chest of drawers transforms your space with a timeless piece of regal elegance. 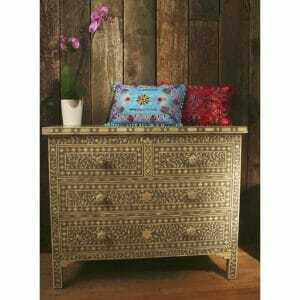 Built to last and be loved for generations to come. 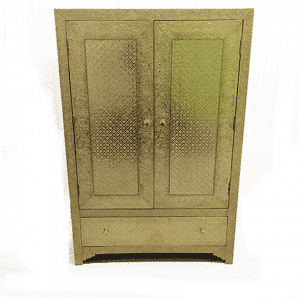 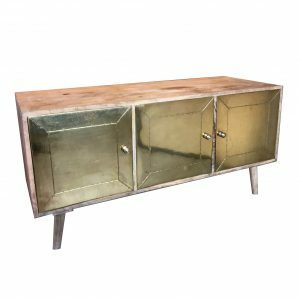 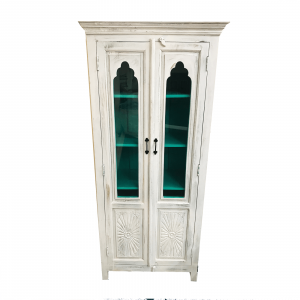 With a grand design and an expansive capacity, the solid Indian dresser is ideal for storing your heavy or voluminous items neatly away while offering the perfect platform for stylish displays. 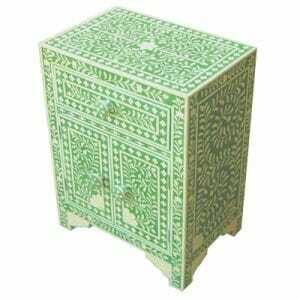 We are happy to say we travel often to Rajasthan and are welcomed by the makers and their families, building on years of good relations and a great understanding, ensuring all trading arrangements are fair for everyone. 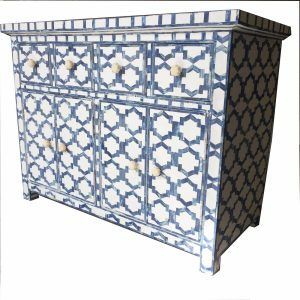 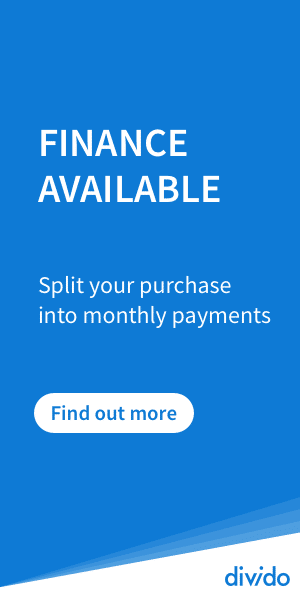 This allows us to offer our customers a bespoke service, so please don’t hesitate to let us know if there’s something from our style range you would like in different measurements. 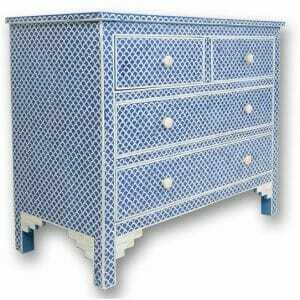 We can provide a quote and have your ideal furniture created for you. 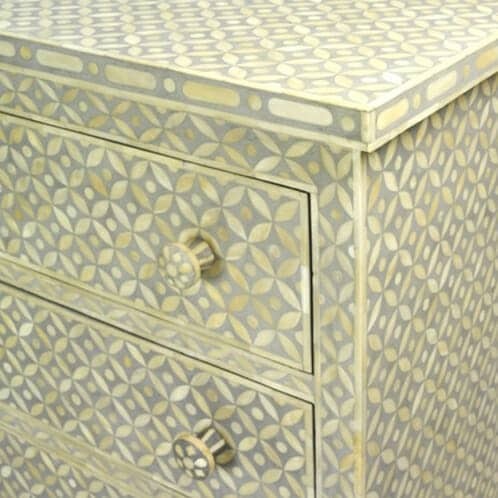 Our regular visits to the region help us keep trading agreements fair and beneficial for everyone, while we know where our supplies come from and maintain a strict policy of ensuring only sustainably harvested woods and ethical, cruelty free camel bone is used in pieces like this beautiful bone inlay chest of drawers.